Perhaps the most mysterious incident in the Torah's account of Jacob's life is the night-long battle described in the closing verses of the 32nd chapter of Genesis. Who is this man with whom Jacob wrestled? According to the Sages, he is the "angel of Esau," and their struggle, which "raised dust up to the Supernal Throne," is the cosmic struggle between two nations and two worlds — the spirituality of Israel and the materiality of Edom (Rome). The night through which they wrestled is the long and dark galut ("exile"), in the course of which Jacob's descendants suffer bodily harm and spiritual anguish, but emerge victorious. The struggle is conducted on two planes — "with the divine and with men." It is a struggle with men: in nearly 4000 years of galut we have wrestled with the Egyptians, the Canaanites, the Babylonians, the Persians, the Romans, the Spanish Inquisition, Nazi Germany and Islamic terror. These and many others did their worst to destroy us, yet we have prevailed. It is also a struggle with the soul of galut, with its Divine essence and purpose. Thrice daily we plead, protest and contest before the Supernal Throne: How much longer? Yes, it is true that these struggles have roused the highest and deepest potentials of the Jewish soul. Yes, it is true that galut has unearthed reserves of faith and wisdom such as would never have been actualized by a tranquil people enjoying a tranquil existence. Yes, it is true that we are fulfilling the cosmic plan in retrieving the Sparks of Holiness buried in the darkest reaches of G‑d's creation. But how much longer must we linger over these "small jars"? And surely You, the essence of Kindness and Goodness, could have devised a way to achieve all this without all the evil and pain! It is a long and difficult struggle till dawn. But in the end we triumph over men and prevail over the divine as well. For this is the essence of Israel. "Prevail over the divine" as the translation of "Yisrael" just doesn't sit right with me. Of course everything is from Hashem, even Esau, so in a sense prevailing over the spirit of Esau is prevailing over the Divine. Pineal Gland Pay attention to the entire verse. This takes place in the Isle of Peneil. The Pineal Gland is the only part of the brain that does not have a corresponding half. It is an "island" or "isle", standing alone in the brain. The Pineal Gland is also where the "third eye" chakra is located, your link to the spiritual world. When one sleeps, one's spirit enters the realm of the spiritual. 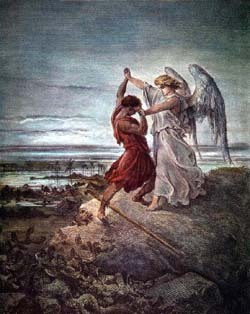 Jacob had a conscious astral fight with an angel, and emerged victorious. This should come as no surprise, since man's spirit is created in the image of Yah, whereas an angel is basically just a servant of Yah with no free will. The reason the fight ended at dawn? When do you wake up? Sunrise. Dawn. Jacob was sleeping. And he limped from that battle... That this passage is of great import is that it is commemorated with the first Kashrut law given just to the Nation of Israel to obey - not to eat the meat around the siatic nerve. All the rest of the kashrut laws are organized separately in a whole book. He limps because he can no longer Walk Tamim as GrandFather Abraham had taught him. This was the wrestling that Jacob encountered with the Divine for those who think you can't wrestle with the Divine. Jacob has mastered the act of 'Standing Before HaShem Tamim" (the test of the Brit Milah) that Abram had eventually learnred to Do, i.e. after his Circumcision. For the story of Abraham is all about walking, and a story that came from the soul of a nomadic people would embed their mystery in How You Walked thru Life. victory over the divine There's a lot about this story I find unclear. What does it mean to prevail over the divine, for example? How can that be? Isn't Israel supposed to submit or be obedient to the Divine? How could a brawl go on all night in the first place? Has anyone ever heard of this? One guy wins sooner than that. But, finally, the angel sees he cannot win, so he uses his magic powers and dislocates Yakaav's hip? If he could do that, then why couldn't he win earlier? How could the angel, with powers like that, not win? And if the idea was not to use powers, then why did he use them in the end? Reminds me of "Bewitched" TV show, where you always had to wonder, if she could do X then why not Y (the solution to the whole problem)? It never made much sense, and it appears right now that this wrestling scenario doesn't either. esav's angel we cannot always take the Torah literaly.